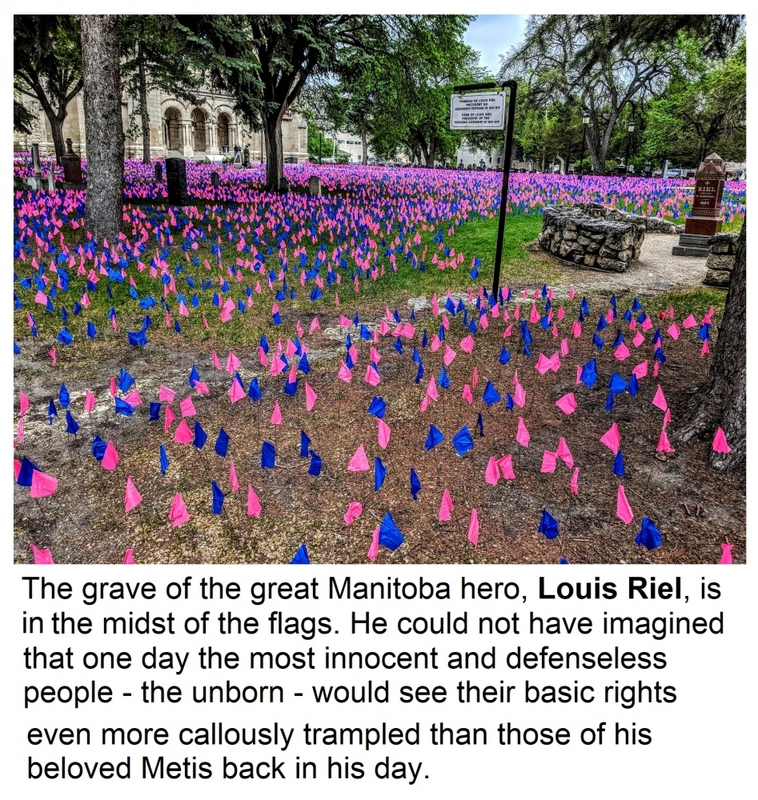 The "Life's Vision" and "We need a Law" pro-life movement set up an unbelievable witness on the cemetery lawn of the St. Boniface Cathedral for Saturday June 9, 2018. 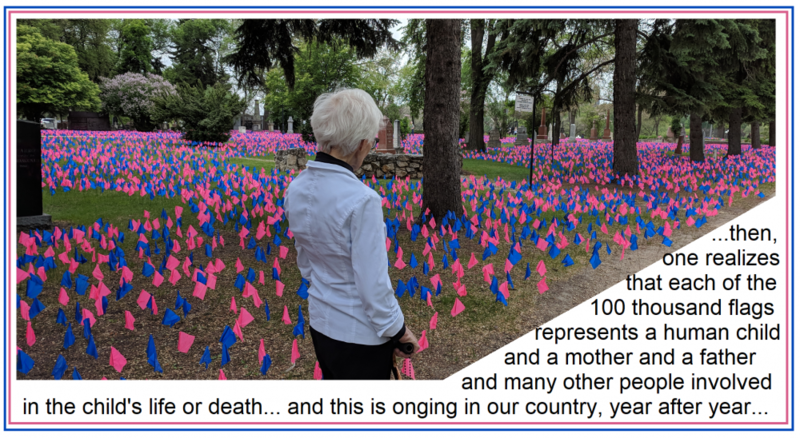 A team of some 150 interdenominational volunteers came early in the morning to place 100,000 blue and pink flags over the entire front lawn/cemetery area. The flags remained throughout the day and many came intentionally or by chance to see them. It was truly a breathtaking sight. As one visitor said, "it is beautiful. The bright-coloured flags wherever you look. But then you understand what they mean and your initial joyful emotions are challenged". What the flags signify are the 100,000 unborn Canadians that die each year to the social tragedy of abortion. As the volunteers that were present all day to enlighten visitors about the project and the circumstances behind it, Canada remains the only country with absolutely no law on abortion - allowing abortion on demand at any point in the pregnancy (!?). They handed out brilliant pamphlets with easily understandable graphs and information. More is available on the website [HERE]. Perhaps the only regret about the display is that it isn't kept out for longer. Not even for Sunday that the church-goers would see it. Perhaps the news media will give it the coverage it deserves - for the message, of course, but also for the sheer volume and the number of volunteers that come out to make it happen. The blue and pink representing the boys and girls that never see the light of day, the life they deserve to life. A number of Faithful of the Ukrainian Catholic Archeparchy of Winnipeg participated in the project. 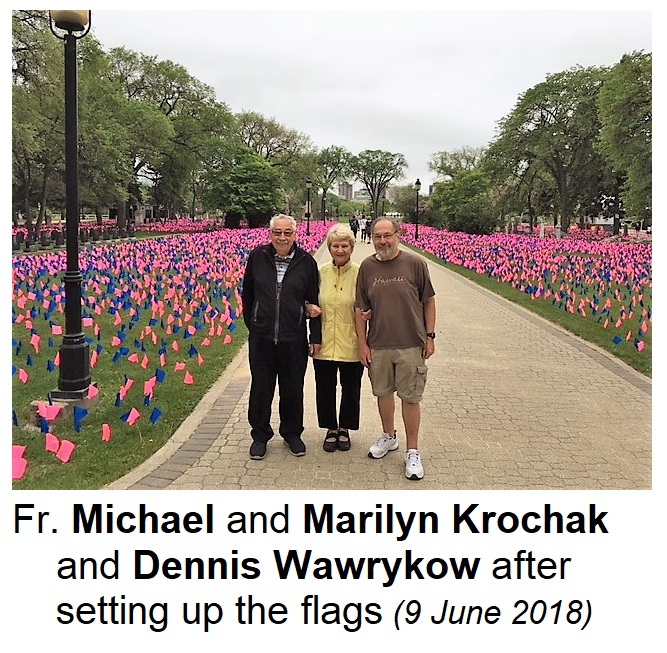 Among those that were there at 8:00 AM Saturday morning to set up the flags were Dennis Wawrykow and Stan Sirdar from St. Joseph Parish and Fr. Michael and Dobrodijka Marilyn Krochak from St. Michael's Parish in Transcona.